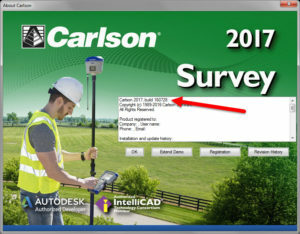 Where do I find the build date or build number of my Carlson Software? To find the build date/build number of the software you have installed, go to the Help Menu > About Carlson. The build will be listed in the top line of the white text box. The number shown here roughly corresponds to the date that the updated file was posted to Carlson’s downloads page using a YY/MM/DD format. Refer to this FAQ to find the current build of the software you have installed.